There are now two ways in which you can start earning for referring today. So, without further ado, let’s find out how you can start building up a second income with Brooks and Kirk today. Our affiliate system is for those of you that are looking to earn some serious money for effortless referrals. Most affiliate systems require you to have your own website or blog. However, with Brooks and Kirk, you can become an affiliate even if you only have a Facebook profile! It takes just a few minutes to sign up to our affiliate system and even better still, it’s free! So, if you would like to find out more about how you can start generating a second income today, then please click on the button below. Whether you have a friend that is looking into becoming an assessor, or you know of several work colleagues that also need to do the assessor course, then our Referral form is ideal. All you need to do is fill in the form below and we will contact your referrals to answer any questions they may have or even arrange to get them started. 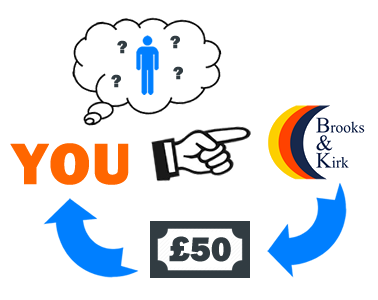 We will then pay you £50 for every person that you refer who enrols onto our Assessor Course!